With only 3 days still to go, The Adequate Commoner has broken 200% funding with tons of cool stretch goals still to go! When John first approached me with the idea for Adequate Commoner, I thought it was a fun novelty. Having worked with John on previous projects and become a huge fan of his prose over the past few years, I really should have known better. John has the unique ability to make me laugh and think (and even cringe with horror) at the same time, whether in his novels, short stories, or gaming supplements. Commoner is no exception. 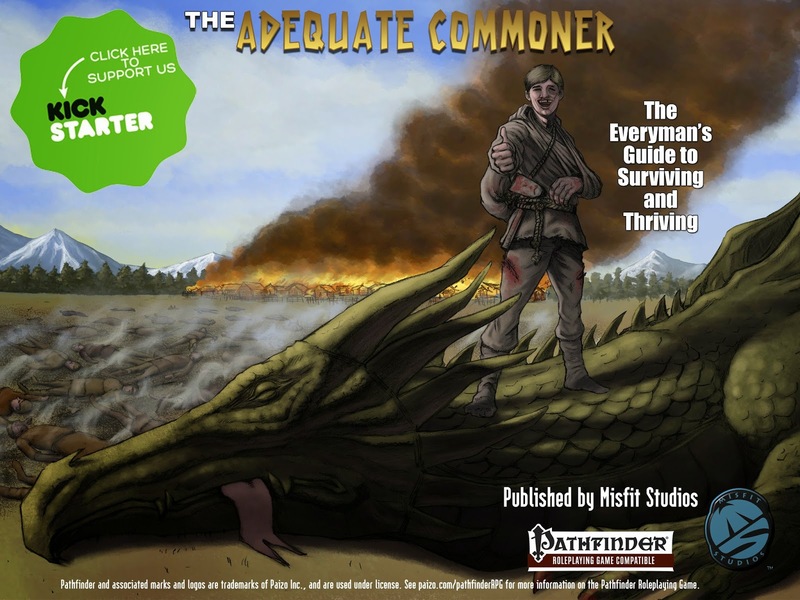 With Adequate Commoner, John has taken Pathfinder to a new and wonderful place. Aspects of the game I've taken for granted for over a decade--race choices, traits and feats, skills, alchemical items, mundane equipment, stealth, ambushes, stakeouts--become hilariously life-or-death. Of course playing a commoner increases the challenges on the table, but it also increases the satisfaction of a game well played in a way I didn't think possible. Commoner adds a level of appreciation for the subtleties of Pathfinder by teaching you to do more with less. So much more. Commoner has changed the way I will play every PF game from now on. I can't encourage you enough to get in on this project from the start. Commoner is one of those rare products that injects new ideas incredible fun, all while it reshapes the way you think about your games. As some of you know, I tore the labrum in my right shoulder while at work near the beginning of the year. Due to the way workman's comp needs to work, they put me on light duty for two months assuming it was a muscle issue and not actual damage. After two months, they had me go in for an MRI (which took a while to schedule), then I made a follow-up with my very cool MD (which took a while to schedule), who then referred me to a shoulder specialist (which took...you get the idea), who told me the MRI showed an "extensive tear" (hint: they don't often use descriptors in these reviews unless it's bad). My new (and also awesome) shoulder MD put the paperwork in for surgery (3-4 weeks to schedule), which then was delayed because I developed a bad chest cold, then delayed longer due to a scheduling issue. Three weeks ago I had my surgery and the experience was very smooth. Other than the tear, apparently my shoulder cuff muscles and joint looks great with no signs of arthritis or other issues, which is awesome to hear. I had my checkup yesterday and was told that the post-surgery pain can go on for 3-6 months, but the doctor feels I'm way ahead of schedule on my recovery, which is all great news. I start physical therapy this week and go back for one more recheck in 3 weeks. After that, I should be able to return to light duty (4-6 weeks) and to full duty after that. It's amazing how long it takes to schedule and juggle appointments, but aside from that, everyone from my doctors to the HR people to the workman's comp people have been wonderful. I'm bummed the pain may go on for a while longer, but I'm very happy with the surgery itself and the relatively fast recovery. Thanks so much to everyone for the support over the past few months. I'm looking forward to getting back to the bedside.